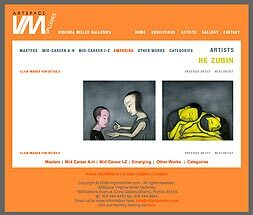 Considered a quintessential Chinese artist, He Zubin is among the leading artists cataloged in the prestigious “2007 Chinese Contemporary Art Document.” His stylized figures, gracefully curved like the subjects of Thomas Hart Benton, suggest the relationship between the characters portrayed. In “Bad Guess,” an older girl, possibly a sibling, holds her hands as if playing a game like “paper, scissors, rock” with a younger boy; in “Doze,” a young couple nod off, their heads cradled in their arms, which intimately brush against one another. Both paintings are rendered in tranquil hues of gray, ivory and olive. The muted colors and gently curved lines present perfectly serene paintings, each a calming visual oasis.